M-Fire's Mighty Fire Breaker™ has the ability to make every wood framed structure safer during construction and after the home is built. When light weight structure products and sheathing were introduced to support housing starts it made fire rescue more dangerous due to fire advance and structural failure. We can not go back to solid timber and plywood, however, we can do more with clean chemistry to make fire rescue and loss less risky. M-Fire's number one goal is to make buildings safer for our brave firefighters and to mitigate insurance loss that help reduce risk premiums. All wood structure fires advance upwards first. Our clean fire inhibitor chemistry application, is designed to stall that advance of fire on the interior lumber during framing. If we stall the advance of climbing flames we allow much more additional time for firefighters to rescue in a safer environment, and helping to stop the fire from turning horizontal, where it moves at an extremely fast new pace called flash over. By keeping fire from reaching the collecting gas in completed buildings and those under construction, eliminates Flash Over, the key to mitigating rescue risk and lower total loss of structures. Firefighting is dangerous work. Responding, for example, to a compartment fire, firefighters are faced with dynamic, rapidly changing conditions that present a significant threat to building occupants and firefighters alike. M-Fires new APP communicates directly to the fire house and fire Chiefs and Captions. 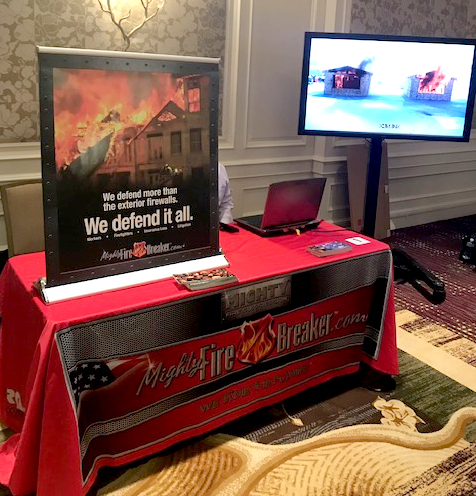 Our goal is to get them real time information so the know if the building has been fire treated with Mighty Fire Breaker™. The data is to help support their planning decisions when they pull up and see there is something radically different about the fire that is struggling to advance.